Disclosure: This article contains affiliate links, which generate income for this free website at no additional cost to you. This article is written for entertainment purposes only and should not be construed as financial or any other type of professional advice. A few months ago, I spoke with an acquaintance about stock splits. Based on a friend's experiences, he thought a split was a devious way for a company to rip off its shareholders. It's not. The act itself is neither good nor bad. There's some mystery surrounding stock splits (and reverse splits, which affected the portfolio of my acquaintance's friend). But they're really simple. This simplicity may confuse people who are looking for deeper meaning. So, let's dive into what splits are, why they're done, what they mean to investors, and more. When a stock splits, let's say by a 2 for 1 or 2:1 ratio, the number of shares are doubled and the price is cut in half. The market valuation of the company (number of shares x price per share) is not changed by this event. Even more important, the value of my holding is unchanged by the split. Let's say I hold 100 shares of XYZ stock and the price is $500; the value of this holding is $50,000 (100 x $500). When the stock splits, I now have 200 shares and the price is $250; the value of this holding is still $50,000 (200 x $250). Similarly, there could be a 5:1 split in which my shares grow to 500 (5 x 100) and the price becomes $100 ($500/5) for a total value of $50,000 (500 x $100). Or, in the case of a reverse split (1:2), the number of shares is halved and the price doubles. For example, I now have 50 shares and the price is $1,000. Again, the value of the holding is $50,000 (50 x $1,000). I'll speculate on why the stock split is orchestrated by a company. A single share becomes more affordable and accessible to more investors as the result of a stock split. More investors who can buy a share (or hundreds of shares) may result in higher demand for the stock. Higher demand can lead to higher prices. A higher price means that this holding is more valuable. But, to be clear, this sequence of events (split, more affordable per share prices, higher demand, higher per share prices) is NOT guaranteed to happen. There's simply the possibility that it could happen. What's important to know is that the underlying value of the shares hasn't changed at all. A reverse split bolsters the per share price. That is, if a stock's price is $1, then a 1 for 10 reverse split would increase its price to $10. At the same time, the number of shares would be reduced by one-tenth. The reasons for reverse splits may include raising the price high enough to avoid being removed from a stock exchange. So, a stock split or a reverse split allows a company to engineer its share price and/or number of outstanding shares without actually changing its value. There are several ways to learn the specifics of stock splits, including websites devoted to this subject. For example, there's StockSplitHistory.com, GetSplitHistory.com, and eoddata.com, which provides end-of-day and historical data on stocks including splits. Information on stock splits can also be found within brokerage firm's websites. To get started, identify a specific stock to investigate. Enter the symbol of the stock being researched in the search bar. The result should be a searchable page that provides detailed information about the company, including financial statements and historical data. Look for Charts (indicating details about stock prices) and Events (meaning corporate events, such as dividends and stock splits), select Splits, and specify the time frame for the search, such as one year or 10 years. Splits will be marked with an “S” on the price charts. Clicking on each S yields the dates and ratios of stock splits. Generally, prices on these charts have been restated to reflect the current reality. That is, if a stock is trading at $100 one day and $50 after the split, prices are adjusted to indicate $50 as the norm. In this way, the charts indicate price fluctuations but not the direct impact of splits. Stock splits should be accounted for and reported on your brokerage account statements. The number of shares should be adjusted as well as the cost per share. Drawing on these adjustments and the market price of your shares or the selling price if you decide to sell shares, the brokerage firm ought to calculate and report gain or loss. Still, it makes sense to keep personal records to verify the firm's calculations. As an example of what to consider, one of my holdings, Nike (NKE) split a couple of years after I purchased some shares. Today, when I review my activity with NKE, I see the number of shares I hold, their market value, and the gain of this holding. I can also find transactions associated with my position, including purchase dates and amounts. There's also an Adjusted Cost column but truly the cost that I paid shouldn't need adjustment. What I paid is unchanging (share price x the number of shares plus the trading fee on the day of the transaction). But the various columns and calculations are more straightforward when the cost per share and number of shares are adjusted. Corporations may use stock splits to influence stock prices; in turn, stock prices may influence investor behavior. Knowing precisely whether a split has increased demand is tricky because the company's fundamentals may also improve or continue to grow at the same time. Whatever the impact of a split, it's helpful to keep records of transactions and know when prices have changed as the result of a stock split. Disclosure: I'm long on Nike (NKE). 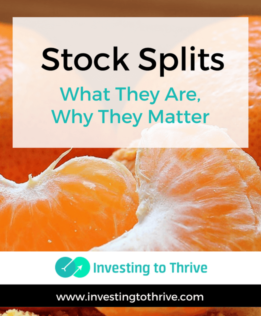 Have you benefited from stock splits? I’ve never directly been involved in stock splits since I don’t own any individual stocks. As far as I understand it, if you want to buy some shares of stock of a company, you can buy fractional shares, right? A stock split might make sense if you have to buy whole shares, but I’m unsure if you have to buy whole shares. On traditional brokerage platforms for individual stocks, you’ll need to buy whole shares. But less traditional platforms such as Stockpile and Motif Investing allow purchase of fractional shares; that’s one of their advantages. Thanks for reading and asking this question. Good stuff Julie. I vividly recall the mini heart attack I got one morning when I’d just started investing and saw one of my stock positions had exploded in size! Welcome! I’m Julie. I’m a writer, business-finance grad, and investor here to help people like you invest without fear. Learn 4 Ways to Invest! Fill out the form for email updates from Investing to Thrive. Per FTC guidelines, I need to tell you that I may be compensated through advertising or affiliate programs on this website. A company with an ad or a link may pay me whenever you take a certain action (such as sign up for an account) or make a purchase. Products or services mentioned on this website are ones I have experience with. In some cases, I may be learning about the product or service so my opinion may change as I get more familiar with its features and benefits. Any mentions and detailed reviews are my own honest opinion. Investing to Thrive owned by Hall and Rowe Media LLC is a participant in the Amazon Services LLC Associates Program, an affiliate advertising program designed to provide a means for Hall and Rowe Media, LLC to earn fees by linking to Amazon.com and affiliated sites. Blog posts and other information on this website are for general purposes of education and entertainment. This information is not to be considered financial, legal, tax, health, or any type of professional advice. The content is based on the writer’s experiences, reflections, and conclusions. The owner does not assure the suitability, accuracy, and completeness of the information provided and will not be liable for any damages associated with the display or use of this information.